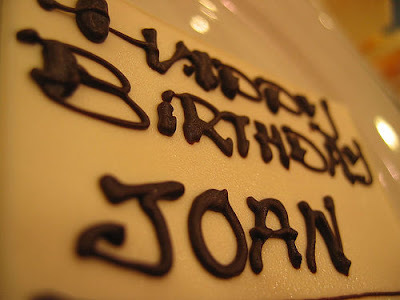 The Artist Chef: Happy Birthday Joanie! How time flies and I am writing another blog about my birthday. It was a hard year for me being thirty even though I know it’s a milestone. It took a while before I understood that I am no longer twenty something. Up to these days I still can’t believe that I am already 31. My being thirty is very eventful. Last year I really had a happy birthday. It was the year that I look forward on a lot of positive things in my life. A lot of positive things did happen. It amazed me and blew off my mind. How I wish I could only cite the good ones. But life is not just about sunny day, it’s also about how big storms will come along and sometimes you are not prepared. I grieved as the two important people in my life passed away. They are the people who helped me mold who I am today. My Lolo Apo and Lola Nay. They are the people who anticipated the events that are bound to happen in my life. Now they will never witness them anymore. Up to now I still grieve. People grieve not just because a person dies but when something also dies. I’ve been thru a lot of hurting and pains. No one will understand exactly how I feel unless they are once in my shoes. I realized the more you are being hurt the braver you get. You put courage in your heart and become your weapon. After the storm you will see the sun shines slowly and see the rainbow coming out. It signifies that life is more colorful after tragedies. You begin to hope for good things and start dreaming again. It was on my being 30 that I became part of Saatchi & Saatchi as a Senior Art Director. Then I left my old condo and moved in to a bigger one. I also won the Jamie Oliver video competition that now opens the door of opportunity going to London. Just recently I accepted a new job in Saigon. I will soon work in a local advertising agency in Vietnam as Head of Creative Group. A lot of doors opened and I see big opportunities. Since I will be working in Vietnam, I plan to pursue a lot of things there. I want to have my Artist Chef in Saigon and at the same time continue my passion for food styling, food installation art and food photography. I’d also love to pursue my graffiti art in every walls of Ho Chi Minh and continue to paint every canvass that I’ll have. They said that a real artist once get hurt, the emotion ignites. They become more expressive and every little thing they do is magic. I hope one day I’ll have my own restaurant and finally have my solo exhibit. Probably in Vietnam when things work out. There are so many things to look forward. As I move forward being thirty something I know that there will be pains and joys, defeats and triumphs; but as long as I live I will thank GOD for every single breath that I am alive. Now, as I start my new journey, I want to find someone who can embrace my dreams, who can appreciate my flaws, who can accept that life is not perfect and so am I, one who will hold my hand in any battles and will never leave me in any storms. Now that I learned my lesson, I have to prepare and be excited what life brings. I have to live my life now according to my purpose and not according to what I want. This entry speaks a lot about you. Nice! Congratulations, good luck and may God bless you always! I left Manila last April 28; sayang hindi na ako makaka-attend ng birthday party mo. U Salamat sa invitation. Nandito na ako sa Australia ngayon. Belated Happy Birthday :) I was out of the country so I wasn't able to greet you sooner. I won't call you Joanie anymore. And I believe you when you say that when someone will call your real nicky "An" then you'll know he's the one. He's just around believe me. Get out where you are now so you can find your pair. Sorry can't resist. I hope to hear from you... I miss your post. Thanks for greeting. Can't wait to write my first post. Life is different now. I will chronicle everything, don;t worry.